This text is a response to the posting The Tactics of Camping by Eric Kluitenberg. It builds on ongoing research of the authors into the history of protest camps as an organisational form. Some further responses can be found in the web archive of the nettime mailing list for net criticism. From Tahrir Square to Trafalgar Square, from the Puerto del Sol to the streets of Oaxaca, protest camps are a highly visible feature of social movements’ activism across the world. Protest camps are spaces where people come together to imagine alternative worlds and articulate contentious politics, often in confrontation with the state. Protest camps are global phenomena, occurring across a wide range of social movements and encompassing a diversity of demands for social change. They are spaces where people come together to imagine alternative worlds and articulate contentious politics, often in confrontation with the state. Based on empirical research into a variety of protest camps, we have developed a framework of analysis for protest camps. Importantly we understand them as a unique organisational form that transcends particular social movements’ contexts. In what remains an ongoing project, we would suggest that there are are four key attributes that appear generalisable to all protest camps. It is not our objective to develop a structuralist account of protest cams reminiscent of resource mobilization approaches but, instead, use these thematic areas as threads to tie together diverse sets of protest camps. This allows us to tell stories (across time and space) about how protest camps are created and set up, how they converge and diverge, and how they share similarities and differences. These four identified areas are: (1) domestic infrastructures (food supply, shelter, sanitation, maintenance of communal and ‘private’ space); (2) action infrastructures (direct action tactics, police negotiations, legal aid, medical support, transportation networks); (3) communication infrastructures (media strategies, distribution networks, production techniques); and (4) governance infrastructures (formal and informal decision-making processes). As these organisational dimensions dynamically interact, they enable and hinder each other, creating specifically configured protest camps. This approach is allowing up to compare and contrast divergent camps and to argue for a new reading of protest camps as emergent, often radically democratic political spaces. Because of their specific character, we argue that protest camps have the potential to enable an experience of new and alternative forms of democracy for participants, although not all camps aim to produce this effect or necessarily have it. Showing how protest camps configure their infrastructures to enable the experiences of participation, collaboration, collectivity and mutuality, we hope to contribute to the understanding of alternative forms of governance and political participation. Something which differentiates the protest camp from other place-based or space-based social movement gatherings and actions is activists’ willingness to forgo the comforts of a ‘normal home'; to brave the elements, living in muddy fields, up trees or on cemented city streets. From this perspective, the protest camp disrupts the very notion of what constitutes a home, and with it, our understanding of public and private, of domestic and undomestic space, as well as our attachments to property and permanence. 2pm, and vans full of people converged from secret venus all over London. 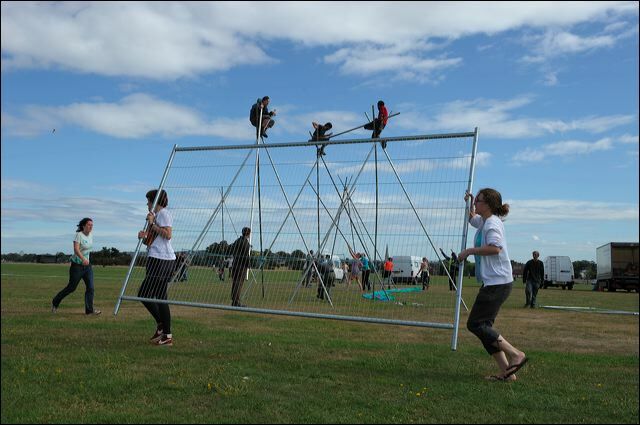 By 3pn the site was secure with tripods and a circular fence. Of interest is how protesters engage in acts of home-building by examining the emotional, affective and interpersonal communicative dynamics that exist between people and objects in the everyday material-symbolic lives of protest. From cooking to cleaning, and shelter to sanitation, protesters and supporters work together to build temporary homes at these sites of protest. The scale of this domestic infrastructures ranges from semi-permanent wooden dwellings and cultural centres to the minimal necessities needed to sustain direct actions. How do activist generate–and fail to generate–domestic infrastructures for and through their everyday operations in relation to their differing objectives. We would argue that people’s perspectives toward each other, as well as towards objects and ideas, are largely shaped through collective acts of home-building that demand a great deal of both physical and emotional labour. Protest Camps are often made to enable political action, and in particular direct action. To target political institutions, power plants or roads, camps form bases for attacks, enabling training and collective strategic planning of direct action. Our work examines how camps function as sites of preparation for action, both in a theoretical and in a more practical sense. 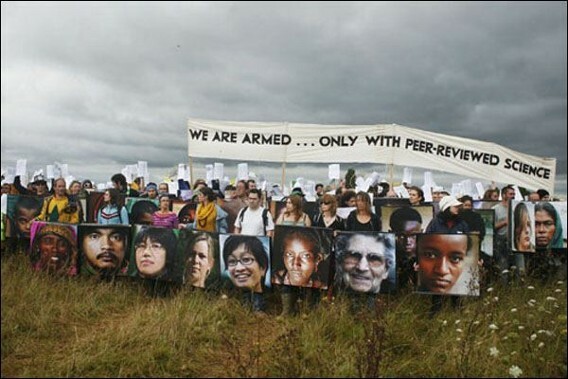 Many protest camps are developed to enable action in remote locations, for example rural sites of road construction, mining or international summit meetings, where housing and feeding of non local activists needs to be provided to enable large protest mobilisations. This instrumental origin of some camps as enablers of protest continues in the set up of training sessions inside the camp. Here activists learn from each other how to do direct action, whether facing police lines or blocking access to contested sites. The logistics of actions are also prepared at camp, for example by distributing maps of key targets, or enabling the formation and co-ordination of affinity groups. Furthermore, the collective housing set up at camp also provides spaces for action debriefs, informally and formally, in which activists reflect on their experiences. As actions can be very intense both emotionally and physically–and often carry legal consequences–medical, psychological and legal support is sometimes provided within action infrastructures, taking on forms such as ‘well-being spaces’ and medical caravans. 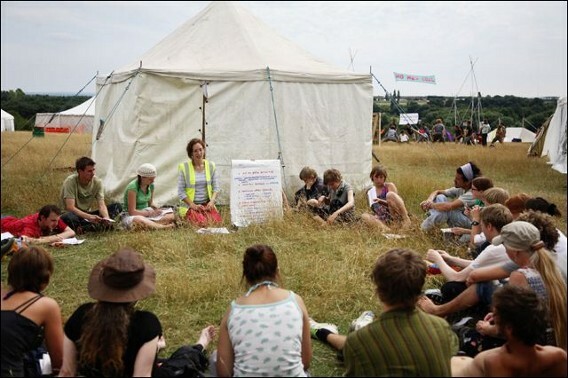 Beyond these forms of preparation, training and debrief, action infrastructures of protest camps often include a number of formalised and informal discursive spaces, whether planned workshops or everyday conversations around a camp fire. Here camp participants develop and exchange arguments that reflect on and justify their actions, sustaining the energy and focus needed for future confrontations with political adversaries. While thirty years ago peace camp newsletters were often hand-written, mimeographed and distributed by post, today mobile phones come pocket-size with cameras and short-run video capabilities. Laptop computers and wireless internet access has enabled temporary autonomous media stations to be set up at protest sites, such as those run by Indymedia at Noborders camps, Climate Camps, and Global Summits. These offer live updates of text, photo and video, keeping both protest campers and the broader public informed. Likewise, some protesters seize and appropriate corporate and state-run media tools, such as Oaxaca women’s take-over of channel 9 during the teacher’s rebellion. At their best, these media stations create spaces for democratic, participatory news-making and skill-sharing, from which people offer a diversity of perspectives and outlooks. Much has been written about alternative media and the role it plays in relation to social movements. However, little of this writing discusses how activists’ engage communication technologies and produce media at the physical sites of protest. We propose to discuss protest camp-based communication practices and media, including media stations and the making of promotional materials, press releases, newsletters and documentary video. We view each camps’ media as part of a broader historical trajectory of activists’ new media practices, expanding our focus to pre-internet and pre-digital cultures to argue that today’s communication practices and infrastructures are heavily shaped by past movement cultures as they came into contact with new devices and platforms. How are camps run, how are decisions made? Often protest camps act politically as democratically run spaces. At times camps create clear infrastructures in the form of neighborhoods and spokes councils based on principals of horizontal decision making, while others are run less formally and spontaneously. Some of the larger camps develop further differentiation, creating roles in specific specialists groups like media teams, conflict resolutions committees and mediators. Generally, there is a wide variety of governance infrastructures observable in a variety of camps. These infrastructures are developed according to needs, largely based on national, geographic, economic and cultural contexts. They are frequently based on participants’ prior experiences with self-governance, and indeed camping. While many differences exits between camps, it is possible to observe learning processes trans-nationally and over time as they occur both between camps and across different social movements. This makes it possible to identify successful approaches on how to run a camp. We argue that the formalisation of internal governance infrastructures is a key signifier of the ‘maturing’ of the organisational form of protest camps. Likewise, the importance of internal governance and its related infrastructures seems to increase when protest camps act less instrumentally as a tool to support action, and more towards larger goals of alternative world-building. In these latter camps, internal governance is explicitly organised as a form of radical democratic action, becoming a distinctly advertised quality and justification of the protest camp. Protest camps are political spaces of high intensity, where democracy can be experienced and experimented in a live form. Often camps are only set up instrumentally to support action in remote locations, sometimes they occur spontaneously without a plan. But even in such cases, we can identify the emergence of four infrastructures, domestic, action, communications and governance. Highlighting these, we show the development of material cultures of protest, combined with new ways of living as they are formed in and by the camps experience. Concurrently we often found evidence of the development of strong collective identities within the camp, which triggered the creation of internal democratic processes. These processes are challenging and surely not always pleasant. They tend to create insider and outsider dichotomies between different camp participants, depending on their level of involvement. Indeed, internal divisions and conflicts are the key to understanding protest camps as alternative worlds and places of radical democratic experiences. These experiences of alternative cultures and governance cannot be made in the regular political process. In the regular democratic process the pains and potentials of participation are limited by institutions that formalise the decision making process. Moreover politics is institutionally separated from life. Protest camps enable the development of alternative ways of housing, feeding, entertaining and living together, alongside innovations in political actions and democratic processes. This is why protest camps are more than just ephemeral places or instrumental strategies of particular social movements. They are laboratories of radical, tangible democracy that more often than not help to imagine and build blueprints for alternative worlds.